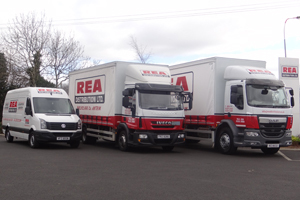 Established in 1981 Rea Distribution Ltd. operate from County Antrim, Northern Ireland and operate a fleet of modern vehicles offering daily services throughout the country. 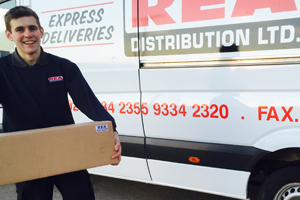 Welcome to Rea Distribution Ltd.
Rea Distribution is a family owned company which have been supplying reliable logistics services since 1981. We currently employ 20 people at our Antrim depot. Our premises are set within a 2.45 acre site boasting 28,000 sq feet of warehousing, storage and cross-docking facilities. The site is highly protected by remotely monitored analytical cctv and alarm systems accompanied with security fencing and electric front gates. We operate a modern fleet of vehicles ranging from small vans to large 44 tonne tractor units. All our vehicles are equipped with GPS tracking devices and in cab communication as well as being fitted with Curtain side’s and Tail-lifts. This allows us to provide a highly flexible and secure service giving our customers a range of options to deliver their valued goods. All our drivers, warehouse staff and operational team members are trained to deal with all your needs, and include GDP (Good Distribution Practice) and Hazardous goods. All Drivers are issued with their own Personal Digital Assistant device, facilitating real-time monitoring and traceability of deliveries. This facility enables our traffic planning software systems to provide accurate up to the minute data retrieval for Proof of Delivery information. In this section of the website we give you the inside knowledge of the company and also the industry. 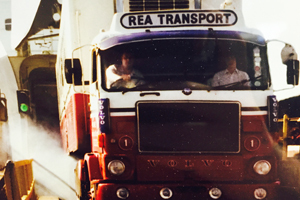 Learn more eabout the 3 generations of Rea Distribution and our humble beginnings. Daily services, specific to cater for your needs plus value added packages, how can we help you?